‘My son completed an 8 Week LUPE Program via NDIS funds end of January 2019. Jeremy has a strong passionate, empowering personality and spoke with such clarity and hope that commanded the immediate respect and attention of my high functioning teenager filled with anxiety, avoidance and exhibiting abusive behaviour in the home involving the police. A month later, my son has since shown improvements in his life and has currently moved into assessing his education rather than avoiding it. My son has stepped out and joined a new group, began to seek part time employment again, abusive meltdowns are significantly reduced and is generally contributing better as a family member. I recently flew to Melbourne to visit the incredible Jeremy Samson from Time 2 Train. Jeremy, who is a radio presenter in Melbourne and the Ambassador for Asperger's in Victoria, has been famous for his program which has led to remarkable improvements for his students with ASD. It cost me $180 in taxi fares and it was SO WORTH IT!! He has told me so many stories of the children who have come into his program not being able to communicate and who can now speak to adults and peers. I was invited to witness the incredible work that he does with children on the Spectrum and I really could not believe what I saw. When I entered the room, he was using his weight and balancing with his non-verbal student, I expect he was building the child's resistance and strength but, as I'm not trained in this area, I really am just guessing. Jeremy, who has Asperger's himself, used so many different techniques during just the one hour session that I was privy to. He used theta rhythm and other sound effects, he turned the many huge fans on in the room as part of his program sparking the interest of his gorgeous student. Massage and stretching was also an important part of the session. Jeremy, encouraged his student to focus in order to sort some cones and as he did so, he himself was creating sound effects to keep this boy on track. When it was time for speech work, you could just see this kid who desperately wanted to communicate with Jeremy and to please him start to copy the alphabet sounds. I would be writing all night if I were to truly capture what I saw during Jeremy's session and I hope Jeremy can enlighten me as to the reasoning behind the many techniques that I saw in Melbourne. Thank you for our meeting afterwards as well Jeremy, I'm pumped about ANY FORM OF COLLABORATION WITH YOU AND TIME2TRAIN OR YOUR LUPE PROGRAM IN THE FUTURE. Thank you, you absolute champion!!!! Jeremy Samson is a brilliant trainer who runs his unique program Time2Train who has experienced life on the spectrum and knows first hand many struggles that our children and adults have gone through and breaks down his exercises so patiently and with great enthusiasm and really understands your children on the spectrum. We have a 15 yr old daughter with Asperger’s Syndrome who trained for 6 months with Jeremy and 12 year old daughter with High Functioning Autism who trained with Jeremy for 2 years at Knox Fitness First. What an amazing experience for not only my daughters, learning great co-ordination, learning about how their brains are wired and how the exercises Jeremy gives makes new path ways to see especially my youngest daughter even want try ball sports and now on an interschool football team and making such a difference with comprehension at school. Jeremy has boosted their confidence, be able to deal with bullying and challenges in different ways that they will both actually attend school without hours of daily meltdowns and being able to go to sleep and have restful sleep without the assistance of melatonin. Anxiety levels & meltdowns are way more manageable and have reduced so much. We have much healthier and productive children will attempt new challenges and not just say no. Our family is not the same, we all open up more and are much closer now and are able to recognise what helps our girls, is also good for the parents too. Physical activity makes a massive difference in anyone’s life, but Jeremy’s exercises just show huge improvements that everyone around can also notice, not just family. Thank you so much Jeremy for your wonderful efforts for both our girls and all your incredible advice for all of our family and assisting our girls to live and breathe their lives and not hide away and don’t be afraid to achieve!
" Talking from Experience "
" Having a child with Asperger's can be very interesting as well as exhausting. We had Jeremy enrolled in an intensive exercise program at the age of seven, for around 2 years. I can honestly say the turning point which sticks in my mind came three months into his program. The primary school phoned me to say "Jeremy is like a different child. He can sit through a whole class without disruptive behavIour and even make it through a day!" I knew then, that all work and the cost was well worth while because Jeremy just kept on improving. That was in 1994 and Jeremy is now a Personal Trainer who has created Time 2 Train to help other young children like himself. I cannot say enough, how important it is for your child to attend regular sessions for as long as practicable. I believe that this continuous structured routine will enable your child to attain the skills and abilities necessary for their future development. " My son who is ten began the time 2 train program with a Jeremy and Taylor 9 weeks ago. He is generally a little uncoordinated and doesn't enjoy sports as they don't come naturally to him. As he lacked confidence he stopped joining in sports with his friends. Taylor has taken time to tap into what motivates my son, and fun ways to achieve an increase in coordination and in turn his confidence! He loves going and can't wait for the next week! I couldn't recommend the program more. My 8 year old son has attended the Time2Train program for nearly 2 years. During this time, he has really enjoyed working with Jeremy and has gained many new skills. His coordination and ability to carry out various exercises and ball handling skills continued to improve throughout the program. However, the main improvement we have noticed is in his confidence and willingness to try new things. He will now give most things a go and is keen to try many new activities. Our son is currently a student of Time 2 Train and has participated in the programme for over 18 months. When starting he was way behind his peers with motor skills and very hesitant to participate in any ball activities. He was also very shy to begin with but has come out of his shell thanks to Jeremy and more recently Jenna, another time 2 train teacher. Jeremy has been an inspirational and motivating role model for our son and his results have been life changing for our son. Just recently he won Jeremys skipping competition skipping 88 jumps in one minute. When commencing the programme he did not know how to turn a rope or rhythmically jump over one. Our training began with tying a long rope to a chair and practicing jumping every day. We are very proud of his achievements from the programme, which have significantly transferred to his academic learning with greater mental processing, focus, improved speech development, organisational skills and determination. Our son continues to participate in this programme as we can see how beneficial and important it is for his development. He is also learning how to manage his emotions and understand the importance of physical wellbeing. As a result of this programme, exercise is a daily ritual/outlet for him. He is participating competently in three different sports in the community. We thank Jeremy and Jenna for fostering his love of physical activity which we hope is a lifelong interest and fostering a “never give up!” attitude attempting challenges even when they are difficult to begin with. We believe he never would have achieved such amazing milestones without this programme. We would like to thank Jeremy for the best investment in our son’s development that he has undertaken. I have 7 year old twin boys who are on the autism spectrum. We have been training with Jeremy for about 6 months at Knox Fitness First. I was attracted to his program for a number of reasons, including that it offered a one-on-one program, and an opportunity for my children to improve their gross motor skills. What we have received from the program has far exceeded this. Jeremy has become a mentor and a friend for my boys in many aspects of life, especially in learning to understand and embrace who you are. His unique position of having lived through many of the challenges that my boys face on a daily basis, means he has great insight and understanding which is so often lacking in society. My children feel safe, accepted, understood and empowered to 'have a go' and are learning how to win and lose and how to enjoy being part of a team-such important life skills but often so challenging for children on the spectrum to learn. As a parent I greatly admire and respect Jeremy, particularly how he relates to the children, but also the parents. I have had a number of insightful discussions with him which have helped our family greatly through difficult times, and this gives us great hope for the future. Jeremy's program has helped my brain think clearly. My memory, my social skills and my eating habits are more balanced. Before I started Jeremys program I was in hospital with an eating disorder. I am now at a healthy weight and mind. I would recommend Jeremys program to boys or girls that may be having difficulties with social situations and obssesive behaviours in relation to fitness and diet. I think Jeremy is the coolest and he has inspired me to follow my dreams in being a professional cricketer!!! I hope to one day work with Jeremy and help others in the same way. We are very proud of Andrews progress, he is determined to reach his goals and has listened to the professionals in order to achieve this. Nick has made significant progress since starting the time2train program 12 months ago. As of yesterday he is completely off all medication including Concerta and Lovan (anti-depressant). Jeremy's Time2Train is a brilliant unique program that children with Aspergers absolutely thrive in. The way Jeremy breaks down exercises in a step by step consistent format and visually teaches children (rather than the normal verbal format that is used) makes all the difference. Our son gained so much from the Time2Train program and now confidentally participates in sport. We are very grateful and highly recommend it. We would like to take this opportunity to sincerely thank Jeremy for the wonderful work he has done with our son in improving his sporting skills and co-ordination. Jeremy has helped our son significantly with enhancing gross motor skills. From a child who did not like sports or any type of physical activity, Jeremy’s 12 week program has helped our child with techniques of how to run, skip, catch a ball, kick a football, dribble a ball, cardio work and even ride a bike! Not only did his ability to undertake sporting activities improve but so did his confidence, concentration and memory. Jeremy’s patience, understanding and care of children on the Autism Spectrum is both genuine and remarkable. Our son enjoyed attending the program on two occasions – asking to return to the program to work on his skills with Jeremy. Jeremy has now become a role model for our son, and we hope a “mate” for life! We would not hesitate to recommend the Time 2 Train program to any family who’s child on the Spectrum is struggling with sports, fitness and co-ordination. We wish Jeremy all the very best in both his professional and personal life. He is truly an amazing and inspirational person! I want to thank you so much for making my son Marcus’s journey at Time 2 Train one of the most memorable and life changing experiences he has EVER had. Marcus was always reluctant to participate in sport because he felt that he was slower than his peers and much smaller in size. The thought of performing and knowing that coming last was inevitable made simple things like playing tiggy and footy with his school mates a chore. When I suggested he attend Time 2 Train and that you would work on his strength and fitness he was willing to give anything a go. The minute Marcus met you I knew that the experience was going to be a great success. You was so welcoming and committed to Marcus eating out of his hand right instantly. Marcus did the whole program and achieved so much success. His local football coach commented on how much Marcus has improved with his overall fitness. At the end of the program, Marcus wanted to renew his membership. He was not ready to give up his one on one time with you. You became such an amazing role model to Marcus and even today when Marcus talks about his future he tells everyone that he wants to be just like Jeremy! You are an inspiration to us all, Jeremy! The Time 2 Train 12 week program provided our son with increased focus, improved concentration, better awareness of left and right coordination and improved spatial awareness. Commencing something new has always been a ‘struggle’ with our son he often feels overwhelmed by new situations and environments which results in straight refusal to ‘join in’ or otherwise the complete opposite overexcited and somewhat boisterous behaviour. Jeremy’s enthusiasm, calmness and never give up attitude was always reflected at each session and before long he had gained our son’s trust and attention to participate. Jeremy’s customised approach towards the program was always evident, not knowing what ‘mood’ or ‘emotion’ he would be presented with on the day from our child, he always handed each and every situation with both professionalism and understanding like no other professional we have ever worked with. Time 2 Train has given our son a ‘life long’ understanding of the importance of physical wellbeing, by providing him with appropriate behavioural outlets through exercise to “let go” of mixed emotions whether that be overexcitement, anxiety, depression and/or at times anger. Our son always left Jeremy’s sessions focused and in the right mind set to do his best not just in the sessions but also in everyday life with the challenges it sometimes presents. 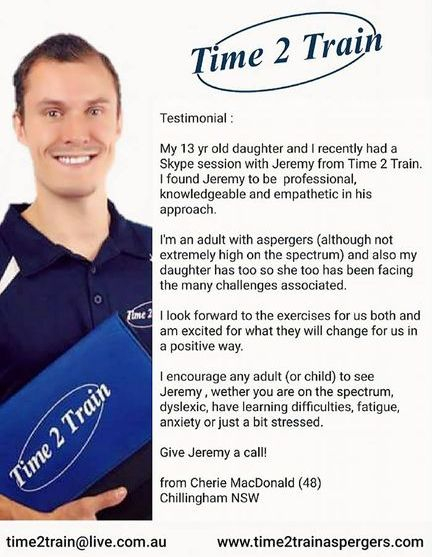 We would highly recommend Jeremy’s Time2Train Program, he is truly an inspiring mentor to both children and parents alike. My son trained with Jeremy on the 12 week program, and from the first session we noticed the love of sport, enthusiasm, skill , patience and personality Jeremy brings to his training sessions. He uses a range of techniques to suit each client as an individual. Jeremy builds a great friendly relationship with the children, and ensures that they have fun, increase their fitness and build more confidence each week. Children always look forward to the fun energetic sessions. Time 2 Train has definitely helped my son's confidence and self esteem to the better. Now that he has a better understanding of and follows particular team sports; Jeremy has encouraged him to join his friends at school to play friendly matches of footy. He has been very positive about this and enjoys the time he spends with his friends now especially when the oval is wet and muddy. Jeremy is an amazing role model for the younger generation to look up to and also a great inspiration to the parents of children with an ASD. My son achieved a wonderful goal today. He did a forward roll. Infact, he did two forward rolls. He is 18. Thanks to his trainer Jeremy from Time 2 Train who facilitates movement and exercise programs for people with Asperger's Syndrome, Nathan has improved in so many areas of functioning. When other 18 year olds are winning academic accolades and graduating from secondary school, I can take Nathan's small achievement into my heart and be a proud mother. Jeremy's program is amazing. Thanks for helping Nathan improve his skills in motor co-ordination. He loves coming to his weekly sessions. He has so much more confidence in himself and is more willing to take risks and engage with people.
" After the trial run we decided to enroll Anna in Time 2 Train program which is specifically designed for Asperger Kids. The trial session contents encouraged us for the enrollment. In few weeks time we started noticing improvement in Anna's coordination skills , focus and concentration. In 8 to 10 weeks we could see substantial improvement in speed , interest in physical activities this further supplemented by school's physical education term report. After the completion of the program Anna could catch the ball with ease, dribble and kick the ball, rope skipping , confident forward roll and speed running. I found this program very unique and great support for Asperger kids. Jeremy is a very good Personal Trainer with good understanding and patience, I would recommend his program to anyone. "The 3 programs from T2T, I took part in, were very beneficial: viewing written numbers in groups are much clearer and improving the short-term memory (remembering sequences - visually) ... also assisting in balance, co-odination and confidence. It gives an opportunity to talk/communicate with an other Aspie and share experiences with Asperger's Syndrome. It's an inspirational program promoting growth in one's self. Training for a NEW LIFE! Please read Anna's Story. Physical activity is vital for a healthy lifestyle for children with and without disabilities. But it can be particularly helpful for children with autism. The benefits of a regular, supervised program of specialised physical activity for children with autism include improved attention span and a decrease in many types of inappropriate behaviours associated with their autism. When I Give A Buck first met Anna in 2010 she was 13 years old and suffered from quite severe autism. As Anna was growing older she was becoming very strong and increasingly active but was unable to safely manage her need for physical activity at home. Anna had participated in some private gymnastics lessons for a while but the financial burden on her single mum was becoming too much to manage and she was forced to go public – speaking to a reporter from her local newspaper and asking for public assistance in keeping Anna in some sort of program. One of our long-time supporters, Caroline Whiteside, saw that article and contacted me about launching an Appeal to cover the cost of Anna’s next term of gymnastics. Anna was already seeing the benefits of the tuition that she’d already had and we were only to happy to launch an appeal to make sure that she could benefit further. $924 was needed for the next term’s tuition. Just after we raised the funds Anna was referred to a fantastic course designed and run by Jeremy Samson from https://www.time2trainaspergers.com The course with Jeremy is specifically tailored to suit children with Autism, Aspergers and other learning difficulties. Jeremy suffers from Aspergers himself and completely changed his life after including regular, structured exercise into his daily routine. He now dedicated himself to helping as many other sufferers experience that same change. Anna completed a 12 week course with Jeremy and the improvement she showed was amazing – and more improvement was expected if her lessons could be continued – so we launched another appeal to raise the funds for her next term, which began in February 2011. After two terms Anna had lost weight, gained confidence and her paediatrician was thrilled with the range of improvements to Anna’s overall health and well-being. We’ve committed to funding Anna’s ongoing tuition with Jeremy into the future. For the moment we’re able to use some grant funding received from the Grosvenor Foundation and, if needed in the future, we’ll launch another appeal for Anna to keep the funding rolling in. ﻿Australian children’s charity I Give A Buck Foundation of Australia Ltd assists children from disadvantaged families who also suffer from a life-threatening or life-altering illness or condition – with particular focus on terminally ill children. When my son first began the course he could hardly catch a ball, skip a rope or even be able to do 2 movements simultaneously with both his arms or legs. He had very low self esteem and sadly little confidence in himself. By the end of the course my son totally excelled. He is now able to confidently catch a ball, skip a rope without difficulty, and co-ordinate exercises using both hands and feet and his ability to stay focused and concentrate for a longer period of time has also improved. You have given my son the self confidence, self esteem and overall confidence to handle situations in life a lot easier. You have managed to do this with the fantastic program you offer and more importantly, you have been a wonderful role model for him. Each time you shard your own experiencs with him, how you were bullied at school, how teachers, parents and students treated you "differently" because you didn't fit into ther "perfect square" and overall the negative memories you have growing up. Unfortunately my son has and still is experiencing these negative memories, but by you sharing your own experiences with him, he has been able to accept the fact that he is and always will be slightly different from most children. But now he has greater confidence in himself and is able to control his behavior a lot better. Thankyou for all your help with my son. Our son Benjamin was diagnosed with Aspergers at age 5. He is now 8. He has had difficulty making social connections with his peers and has had considerable difficulty with gross motor skills.... physical development had to be taught rather than it coming naturally to him. He has experienced difficulty with awareness of his own body space and appeared to be clumsy and awkward when running and playing team sports.... he was constantly trying to move through spaces which would not accomodate him, bumping others and knocking into them when on a footy field leading to additional social issues with his peers. Every movement was in haste and when participating in ball games could not control how hard and how fast he would throw or kick a ball. He was all about speed rather than skill. He was unable to plan how to get his body to do some of the trickier childhood things we take for granted like riding his bike. Ben has been involved in early intervention and many other programs to help him integrate with his peers. Ben has completed two terms with Jeremy so far and we are so thrilled with his progress. The program that Jeremy has developed has given him a fantastic awareness of his own body space and has fine tuned many of the skills that Ben requires in the school yard to help him fit in with his peers without the constant incidents that were being reported. This has boosted his confidence enormously and we are very grateful for the wonderful connection Jeremy has made with Ben. Ben has learned to slow down and focus on the skill required to complete a task, he has learned to be aware of what is happening around him, his ball skills and hand/eye co-ordination have improved markedly and after years of trying, has mastered riding his bike! Staff at Ben's school have noticed a great improvement in his body awareness with far less reports of bumping, knocking, rushing and greater ability to apply himself to a task in the classroom. His skills that were delayed are now in line with his peers. This has led to Ben being happier. We praise the program that Jeremy has implemented for our son and we highly recommend participating after the enormous benefits Ben has experienced. Thank you Jeremy! Our son has Asperger’s Syndrome with co-morbid Tourette’s Syndrome (very mild). He has the eye hand co-ordination, poor core strength, and other motor skill problems associated with Asperger’s. We had tried a number of different sports to try and help but most of these attempts ended with him refusing to continue as he lacked confidence in himself, or was confused by the traditional training methods. We had been looking for a one-on-one physical education program for him to do when a friend told us about the Money for Jam Program which featured Jeremy Samson from Time 2 Train. Riley has been training with Jeremy for 6 months now. There has been a phenomenal improvement with his co-ordination, balance, core strength, and with his willingness to give different sports and physical activities a go. Jeremy has also been able to mentor Riley about his experiences in the school playground with bullying and being left out of games because Jeremy has experienced this himself. During the time Riley has been seeing Jeremy he changed schools. The change was very smooth. Riley was able to talk to Jeremy about this change. There have been other noticeable changes at school his concentration in class has improved, his ability to sit still has improved and his willingness to give it a go. We believe training with Jeremy contributed to his smooth transition, with Riley feeling he could discuss issues privately and without condemnation with Jeremy. It is our plan to continue Riley’s program with Jeremy and Time 2 Train. We can see Riley enjoys the activities and looks forward to his weekly workout. Why change a good thing that is having obvious results for not just Riley’s but his parents also? We would Recommend Time 2 Train without hesitation to others who have not yet taken the step. My son has Asperger's and he does well academically but has always struggled at school with sports. As he lacks balance, speed, motor co - ordination and self confidence, he is self conscious and doesnt join any games, due to fear of failure. His lack of confidence and awkwardness has caused him to be a target for bullies since he started school. When we watched time2train on Money for Jam program, we knew that this was exactly what ourr son needed to help with his motor co - ordination problems. Our son has been with time2train for 7 months now and for the first time he has got all grade 1's in his P.E report, we never expected this to happen. In the past we tried several sports with Jack such as softball, taekwondo and swimming, but he would always compare himself to others and refuse to continue. Jack wasn't happy in the beginning attending the classes with Jeremy but now he willingly goes and his self confidence has improved aswell as his somersaults and skipping etc. Jeremy knows what its like to be picked on and wants to make a difference in our children's lives, his patient - kind and sensitive and is a positive influence on Jack. This is proving to be the best intervention money weve ever spent. I would highly recomend time2train to anyone who has asperger's and motor co - ordination difficuties. Keep up the goodwork Jeremy and best of luck with your future. My son Jordan did a twelve week program with Jeremy Samson. I found that Jordan improved over the sessions, in all the different activities that Jeremy provided. Jeremy is a wonderful asset to the community as he has the insight as to what our children with Aspergers need. I also found that Jordan improved immensily with his memory, his coordination, his skipping and even with some aspects of his personality. My family has been associated with Time2Train since October 2009. Our son attends weekly 1 on 1 training sessions with Jeremy, and I have been so impressed with the program that Jeremy runs. At the start of the course, Billy could not do a somersault, could not use a skipping rope, and was generally unco-ordinated. In a short amount of time, Billy's co-ordination, eye/hand movements, and enjoyment of sport in general has improved immensely. To watch Billy's excitement during the lesson is beautiful. Many people have commented about the difference in Billy. Together with regular Chiropractic work and dietary supplements, Time2Train has filled the void that Billy had been missing, the cognitive work within the program is amazing, and it varies every week. Jeremy is a great Mentor, kind and consistent. I highly recommend Jeremy and he's program to anyone who has Asperger's. "I have been training with Jeremy on his program for a period of 4 months. I have found the program to be very helpful and has enabled me to improve many of the skills which i struggled with during my youth. Jeremy has made the sessions a lot of fun due to a wide variety of exercises that are part of the program. Jeremy has a great knowledge in the area of personal training and is very pleasant to work with. I would recomend him to anyone serious about wanting to improve themselves". “We have been working with Jeremy at Time2Train for over three months with our 5 year old son. We cannot speak highly enough of Jeremy’s program which has developed our son’s fitness, gross motor skills and problem solving thought processes. We are thrilled with the progress our child has made and more importantly the fact that he is having fun and developing a relationship of trust and admiration with Jeremy. Jeremy is a focused and motivated personal trainer who has great intuition with respect to what areas children with Asperger’s Syndrome need to develop and the means to develop such areas. Jeremy is also very responsive to our child and is happy to tailor the activity and/or language to suit his changing needs. We would thoroughly recommend Time2Train to anyone looking for a means to develop their child’s confidence and fitness in a structured environment that is either one on one or a small non-threatening group".